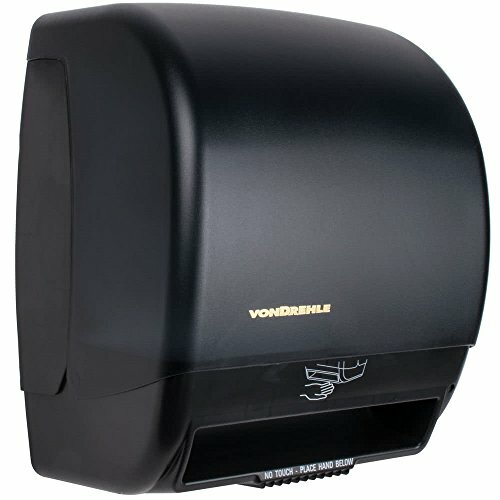 The VonDrehle 2245 black automatic hands free paper towel dispenser is a dependable, hygienic solution for your restroom! The touchless, automatic design has a moisture sensor that dispenses a towel when wet hands are placed below the dispenser. This design reduces the risk of cross-contamination and protects the paper towel until dispensing. This hand towel dispenser has three separate adjustments for maximum flexibility. First, you can adjust the dispenser's time delay to 1, 2, or 3 seconds. Second, you can control the sheet length dispensed: 9", 12", or 15". Third, you can fine-tune the amount of paper dispensed with the paper saving mode. This mode adjusts the length of the second sheet dispensed to reduce waste. You can choose from 0 percent, 12.5 percent, or 25 percent savings. For example, if you set the standard length to 9" and choose 12.5 percent paper savings, the second sheet dispensed will be approximately 7 15/16" long. This hands free paper towel dispenser's housing is made from durable black ABS plastic. It can dispense non-perforated roll towels up to 8" in diameter and 8" wide with a core size of 2". Four "D" batteries power this paper roll dispenser, and they are located in the front of the unit for easy changing. Preliminary tests conducted by VonDrehle have shown that one set will last almost 2 1/2 years with an average of 100 dispenses per day! First, you can adjust the dispenser's time delay to 1, 2, or 3 seconds.